Are you ready for your virtual journey to China? 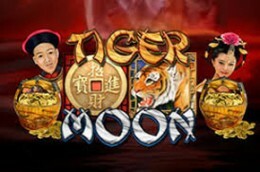 Tiger Moon is an online video slot with an Asian theme and related Asian symbols and graphics. This game is a 5-reels slot with 243 ways to win and it was released by Microgaming software developer. The lower value symbols are represented by the usual playing cards (9, 10, J, Q, K and A). On the other hand, the higher value ones are a male and female characters, a basket of gold, and a jade insect. The wild symbol is a Chinese coin and the scatter is the tiger.